Yes, there is a difference. 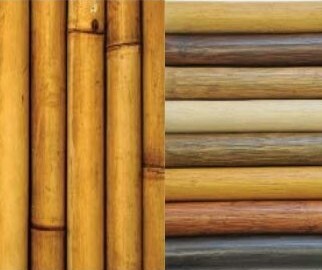 Many people use the terms bamboo and rattan interchangeably, but looks can be deceiving. Bamboo is a tree that grows in abundance throughout Asia. The tree is straight, hollow, and has distinctive horizontal notching. The diameter of bamboo varies greatly depending on the age of the tree. Its poles cannot be bent which limits they types of furniture designs it can be used for. In addition to using bamboo poles for furniture frames, the bamboo can be carefully crushed into a flat surface to make a textured furniture veneer (crushed bamboo) or crushed, sanded smooth and filled with resin to make a polished bamboo veneer. Slats or rings of bamboo can also be cut for use as a decorative furniture detail. Rattan is a climbing palm vine with a solid core that wraps itself around other trees. Like bamboo, it has horizontal notching on its skin (skin-on rattan). When heat is applied to rattan vines, they can be straightened or bent into endless shapes while remaining strong. Skin-on rattan can be finished with a clear coat or the skin can be removed to allow for any finish stain to be applied. The inner core of the rattan vine cane be sliced into spaghetti-like strips to make wicker or flat linguine-like strips to make cane. Both bamboo and rattan are highly sustainable materials based on their quick growth cycle and relative abundance. Their warm, rugged texture make for beautiful furniture that is at home in almost any setting.